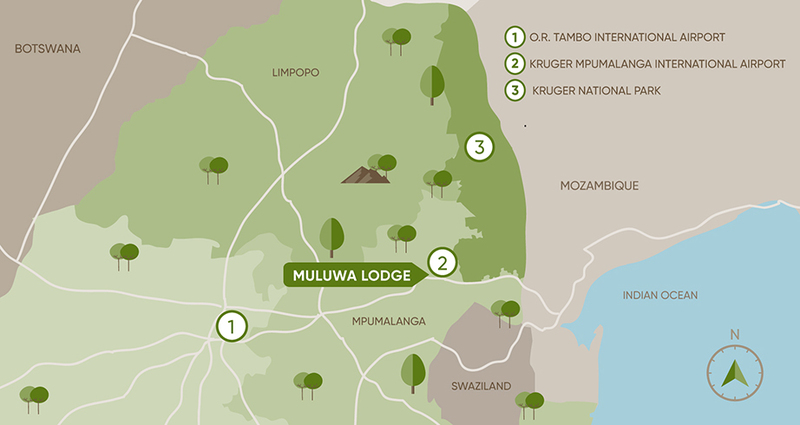 Muluwa Lodge is situated within the Likweti Bushveld Wildlife Estate, in Whiteriver, Mpumalanga, South Africa. An ideal location to use as a base to explore the Mpumalanga region and surrounds. Muluwa Lodge is an easy 4-hour drive from Johannesburg, conveniently located on the outskirts of White River, situated just 20 minutes outside of Mbombela (Nelspruit). Exit Gauteng on the N4 highway, in an Easterly direction towards Mpumalanga, past Middleburg/eMalahleni, to Nelspruit. As you approach Nelspruit signage, take the R40 turnoff towards White River. Drive approximately 14km up the hill, through the traffic light at the Kiaat Private Hospital, over the hill into Rocky’s Drift. At the second traffic light, you will see an “Engen” petrol station on your left, continue straight. Continue for 6.4km up and over the hill. Pass over the Stop Street at the top of the hill, then down the hill and turn right onto the Curlews Road green/white sign. Drive 5km to Likweti Bushveld Estate’s/Muluwa Lodge gate on the left. When arriving at the main security gate, the driver needs to go up to the Key Pad station on the wall and press “609” – this will call the lodge, a member of the lodge staff will answer and open the gate. Drive into the estate for approximately 2Km’s until you get to the lodge which will be on your left. Departing from the KMIA Airport, drive to the traffic circle at the R538 and turn right. Drive +/-3km to the 3-way Stop street and turn left onto Plaston Road. Drive up the hill for +/-3km and turn left into Curlews Road. As you exit the estate, the lodge security will open the gate. Exit onto Curlews Road, and turn right. Drive +/-3.5km to the T-junction Stop street, turn left here into Plaston Road. Drive for approximately 6.4 km, through the Stop street, and down the hill to the R40 and turn left, through Rocky’s Drift towards Nelspruit. Once entering the outskirts of Nelspruit, continue for another +/-5km to the R104 Samora MachelDrive and turn right, to join up with the N4 highway. After +/-30km, turn right onto the R539 Schoemanskloof Road, stay on this road until it re-joins to N4 Highway and follow the road signs past Middleburg/eMalahleni to Johannesburg, Gauteng. Travel 3.5km to the T-Junction stop and turn right into Plaston Road. Travel down the hill for 3km to the 3-way stop street. Turn right and travel 3km to the KMIA traffic circle, take the first left turn and enter the airport parking area.